Audio Transcript: Responsive feeding, baby's hunger cues, and knowing when baby is full. 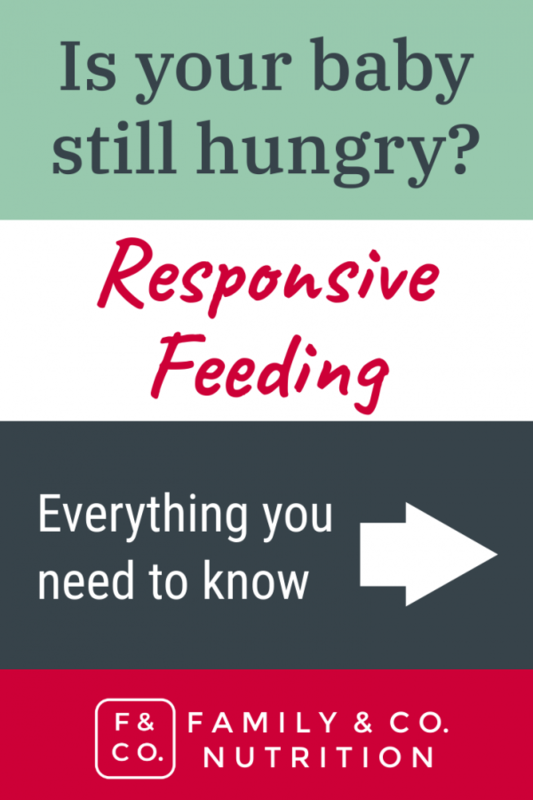 What is responsive feeding? How do I know when my baby is full? Responsive feeding happens when parents are in tune with their baby’s hunger cues. It’s a process where both baby and parents learn together. 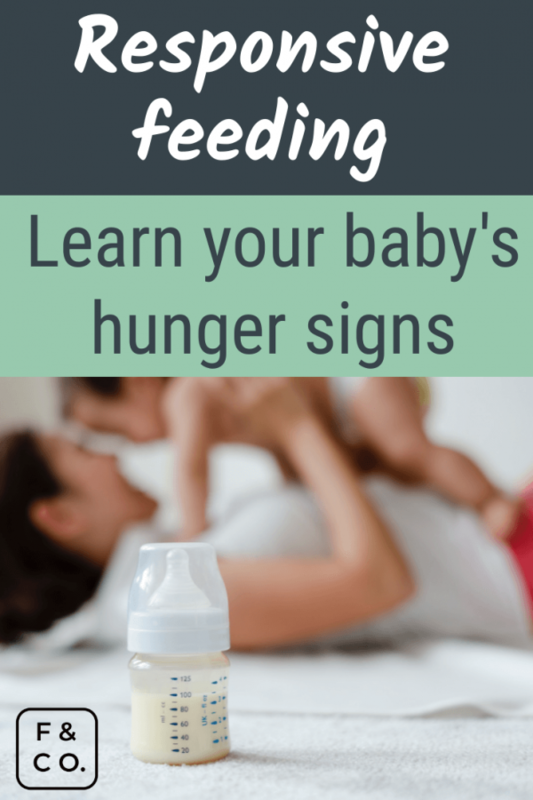 This means parents learn to recognize when their baby is full, or signs that their baby is still hungry. It helps set the foundation for healthy eating behaviors later in baby’s life. Responsive feeding behaviors are predictable, and appropriate for baby’s age/developmental stage. In other words, responsive feeding leads to a balance between parents and baby. Sweet harmony! Both partners lead in this dance. Being aware of a baby’s hunger cues, and knowing when baby is full will help them learn to self-regulate as they grow. It’s like the goldilocks effect …just right. Research shows us that eating behaviors (food preference, intake patterns, etc.) that develop as a baby, set the foundation for eating behaviors later in life. This means parents play a huge role in shaping their baby’s future relationship with food. Don’t panic! We’ll explain why and how you can adopt more responsive feeding practices. Responsive feeding helps set the foundation of healthy eating habits, promoting more self-regulated eating behavior in children. Are you ready to help your baby have a healthy relationship with food? First, you have to understand a bit more about their eating behaviors. Researchers studying childhood obesity and food psychology (among others), have developed an array of tools to better understand and characterize eating behaviors in children. OK, the data isn’t perfect, but researchers link these behaviors to your child’s health. Food approach behaviors are positively associated with body mass index (BMI). Whereas, some food avoidance behaviors are negatively associated. It makes sense. Behaviors like emotional overeating may promote a poor relationship with food and negative health outcomes. What factors influence your child’s eating behaviors? Research shows both genetics and environment affect eating behaviors. For example, satiety responsiveness may be strongly influenced by genetics in early childhood. Whereas, emotional overeating is less genetics and more of a learned behavior. Age is also an important factor. Data shows that food avoidance behaviors decrease over time. Whereas, food responsive behaviors increase. This is super cool. It means babies become more responsive and show self-regulated eating behaviors as they grow up. This is partly because parents control the eating environment less over time. It brings us back to the parents! Parents share genetics with their children. They also control the eating environment early on. Environmental factors also include: food culture, socioeconomic status, food accessibility, and the family’s eating practices. Recall, genetics and environment are two of the determinants of children’s eating behaviors. Now it’s easier to see why parents play such a huge role in shaping their children’s early eating habits. Parents influence their children’s eating behavior through shared genetics, and by influencing the food environment. Have you stopped to consider everything YOU control surrounding feeding your baby? Whether it’s selecting what food to offer, deciding portion sizes, when/how often baby eats, and even the social environment during meals. It’s not surprising that parents play a major role in shaping their baby’s early food environment. In fact, how parents shape their baby’s eating behaviors gets a lot of attention from researchers. The hope is to educate parents and promote the use of responsive feeding behaviors. This will help children grow up to be healthy and have a good relationship with food. With the right advice and plenty of practice, things can improve. There’s plenty of opportunity to practice because you have to feed kids all the time! 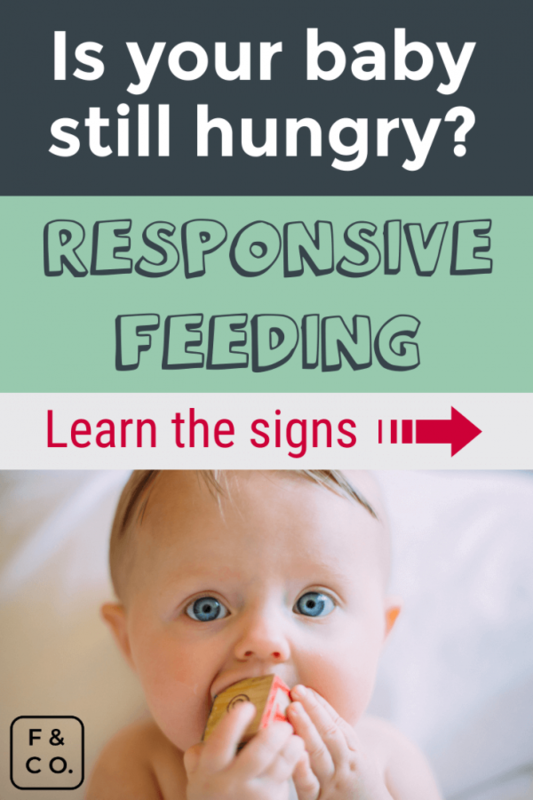 Remember, responsive feeding helps parents know their baby’s hunger cues and fullness. Non-responsive feeding may result in feeding children for reasons not directly related to hunger. This is when parents coerce children into eating certain foods, or more volume. Data shows this promotes food avoidance behaviors like picky eating, and negatively affects food enjoyment. Here parents offer food as a reward, or to provide comfort. Instrumental feeding is often used to manage children’s behavior in the short term. Long term data shows harmful effects on children’s eating behaviors. The “forbidden fruit” idea. Kids end up wanting more of the restricted food, and show poorer self-regulation in the long term. Everything in moderation please. This is when children are encouraged to finish portions, or eat because food is on the plate. It tells your baby to ignore their hunger cues, and to eat portions decided by the parent. Routine is super important but eating should not be forced if your child is not hungry. Instead, encourage your child to enjoy the social aspects of meal time. This will contribute to greater food enjoyment long term. It is not about encouraging your kids to eat, forcing them to finish their plate, or bribing them with food. Nor is it rewarding good behavior with food. And, it definitely isn’t using technology (TV, iPad, phone) to ensure proper food intake either. Instead, learn to pay attention to your baby’s hunger cues to learn their signs of fullness. The quicker you tune in to these cues, the easier it becomes. 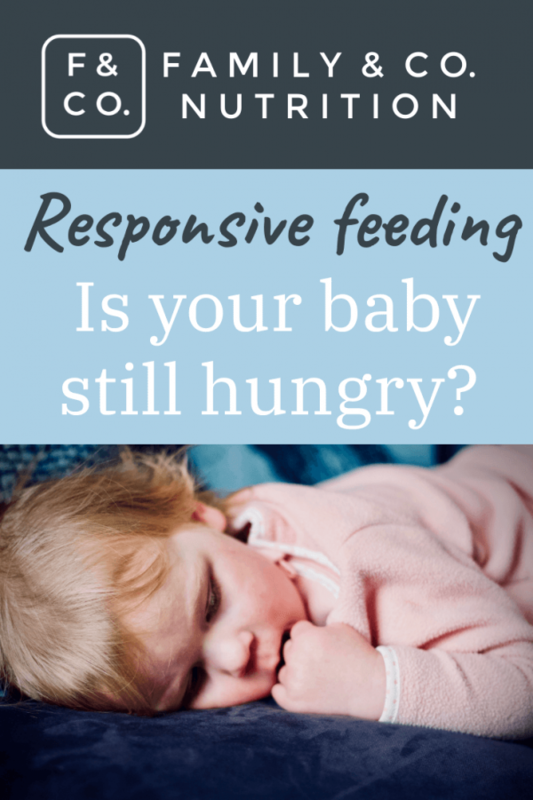 Responsive feeding means being attentive to your baby’s hunger and fullness cues. This happens by being present and in the moment. 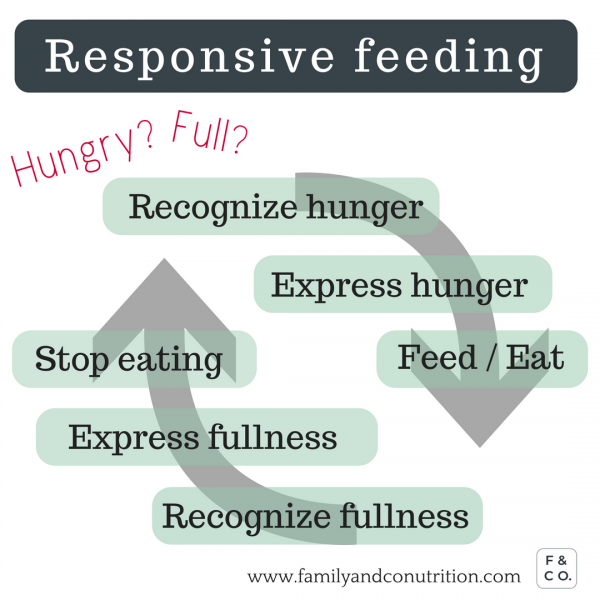 As a parent, do you practice responsive feeding? Do you understand your baby’s hunger cues and developmental needs? Do you modify your parenting behaviors and strategies based on your baby’s hunger cues? Are you tuned in with your baby’s specific hunger cues as they learn to eat? Do you avoid comparing your baby with older siblings or past parenting experiences? If you answered YES to most of these points, that’s wonderful! If not, that’s okay too. 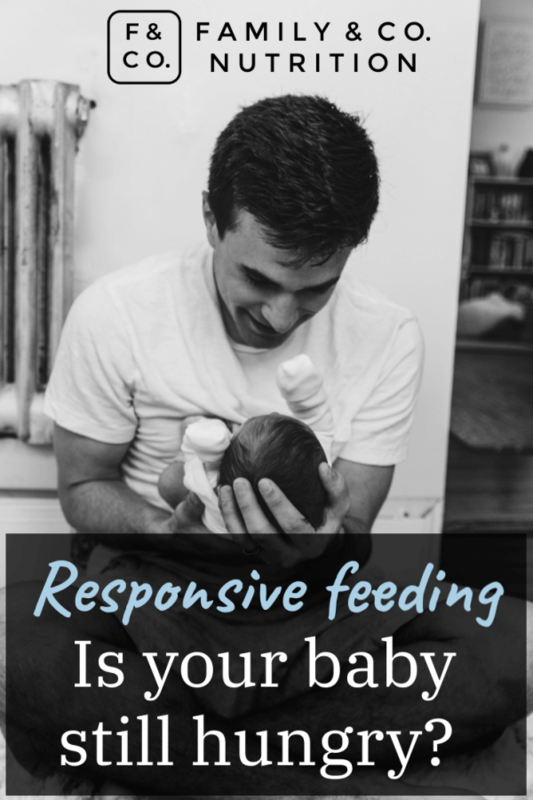 Now you have a greater awareness of what responsive feeding entails, and we’re here to help you! 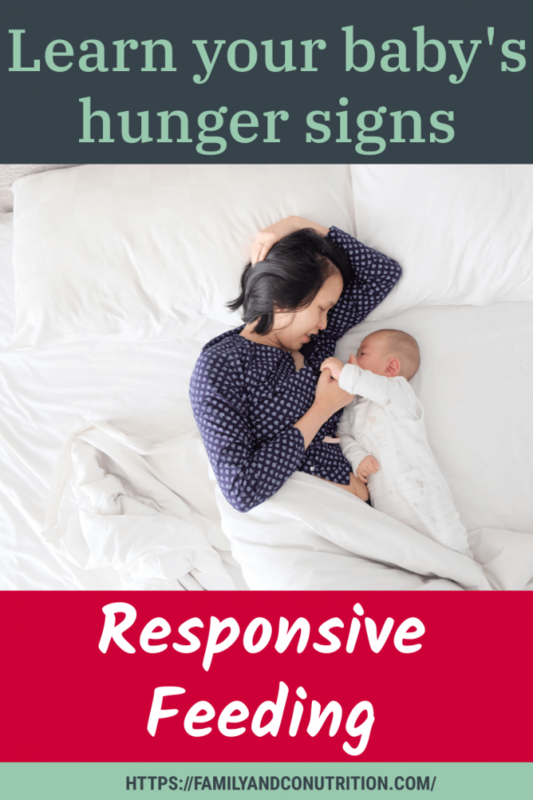 Responsive feeding: is my baby full or hungry? Ideally, we want everyone to be in touch with their body’s hunger cues. This starts with babies, who are learning how to eat and recognize when they are hungry or full. As parents, we have to support their development by being attentive. This is what the cycle of hunger and fullness looks like. Self-regulation is the ability to recognize and respect these signals. “Recognizing fullness” is a step often overlooked in our society. We live in a time where food is abundant and “mindless” eating practices often take place. Signs baby is hungry: restlessness, irritability, crying, rooting, sucking on his/her fist, lip smacking. Signs baby is full: closing his/her lips, refusing to open the mouth, turning the head away, refusing to eat, falling asleep, getting distracted, wanting to play, crying. As you spend time with your child, you will get to learn and intuitively know what they want or need. Trust and respect their hunger cues, and trust your parental instinct and judgement. You both will grow together and learn from each other. A good way to do so is to follow the golden rule. As parents you decide WHAT, WHEN, WHERE, and HOW food is offered. Trust your child to know IF and HOW MUCH to eat. It will promote autonomy and self-confidence. Responsive feeding works with formula-fed or breastfed babies, and children learning to eat solid foods. The feelings of fullness and hunger cues are present in all healthy babies! Another good way to promote responsive feeding is by being a role model. Children learn by observing and imitating parents and adults. One of the best ways to teach your baby is to lead by example. Learn to recognize your own hunger cues and feelings of fullness. Respect them for most meals, and you’re in good shape! Although babies can self-regulate, their hunger/fullness cues are more subtle because they cannot speak. Parents need to be present and attentive to the signs their child might display. After all, responsive feeding also encourages the social aspect of feeding and eating. This includes sharing a meal, discussing how it looks, tastes, and smells. Chatting about your day…being present and being together. We love responsive feeding because it helps establish healthy eating patterns later in life. The infant/child is trusted to know when to eat, and when to stop. When it comes to babies, parents have the tricky tasks to reading subtle hunger cues. Being present-minded and attentive is the best approach. 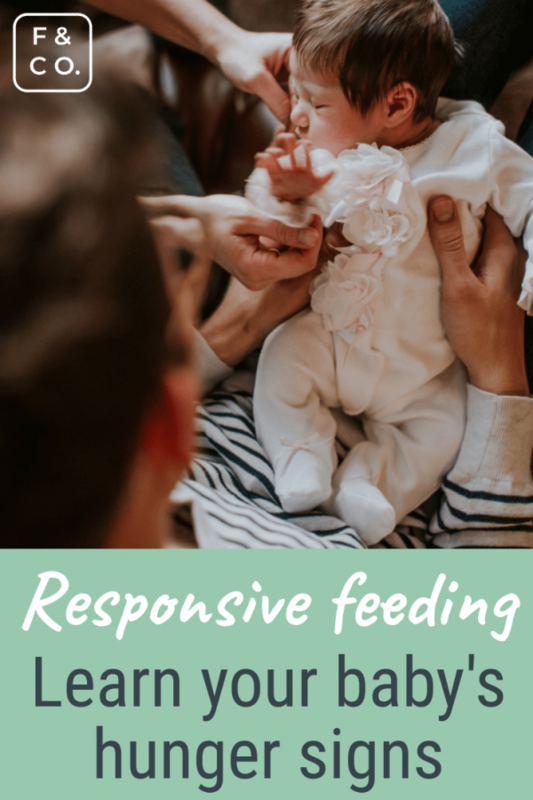 Responsive feeding: it’s more than just the parents! Where do children spend most of their days when parents work full time? At daycare! Visiting grandparents! With a nanny! These adults have a huge impact on your child’s food environment. Caregivers are role models like parents and family members. Their personal relationship with food will reflect in their feeding behaviors with your child. The food environment at daycare is important and includes the type of food offered, the caregivers’ relationship with food. Nope, you don’t control a lot of this – you probably won’t even witness it as you are not there during the day! Here are points to question your daycare about because they will help establish a healthy relationship with food. Everyone eats the same meal at the same table, at the same time. That includes the caregiver who acts as a role model. They interact, learn from each other, and they learn from the adults at the table. For older kids, it’s ideal to let them serve themselves by placing the meal in the middle of the table. Kids self-regulate their food intake better when they have a routine. They know when to expect snacks/meals and can decide to respect their hunger cues and eat now, or later. Serving snacks over a “window” of time rather than a fixed time is ideal. For example, having snack time from 1:30 to 2:30pm, rather than at 2pm on the dot. This one can be more difficult to implement because of different logistical reasons. It can be messy to let kids serve themselves snacks. There may be food safety concerns as it’s harder to supervise kids eating at different times. Some worry that children may overeat if they have snacks available. Or, they may not eat at all because they are busy playing. But remember, part of learning to eat means missing a snack one day, but being more attentive the next. Kids are smart and will figure it out! Parents hope that kids will develop lifelong healthy relationship with food. Responsive feeding strengthens self-efficacy, self-regulation, and management of emotional aspects of eating for kids – all great skills for their future! Here’s the rundown. Feeding your baby for reasons other than their internal hunger cues is known as non-responsive feeding. It falls into the category of intrusive and controlling parenting. Experts in this field believe this can interfere with your child’s ability to learn self-regulation of food intake. The goal is to teach your baby eating habits that center on their internal feelings of hunger or fullness. How can you do this? By practicing responsive feeding! 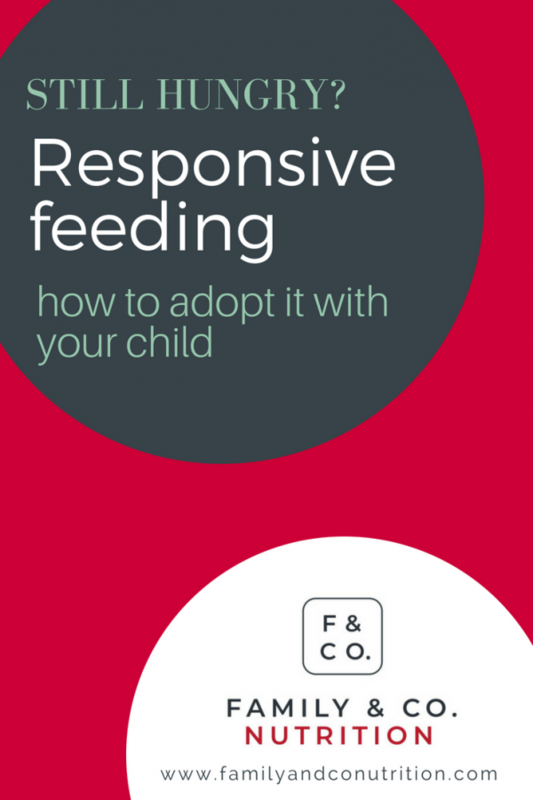 Responsive feeding is an important element in the parent-child relationship. More broadly, it is considered a component of responsive parenting. This describes a relationship of reciprocal benefits for both parent and baby, and supports the healthy growth and development of your child. Are you ready to practice more responsive feeding practices? If you have any questions, we’re always here to help! Mallan, K., & Miller, N. (2019). Effect of Parental Feeding Practices (ie, Responsive Feeding) on Children’s Eating Behavior. In Nestle Nutrition Institute workshop series (Vol. 91, pp. 21-30). Ventura AL. Associations between Breastfeeding and Maternal Responsiveness: A Systematic Review of the Literature. Advances in Nutrition, Volume 8, Issue 3, 1 May 2017, Pages 495–510. 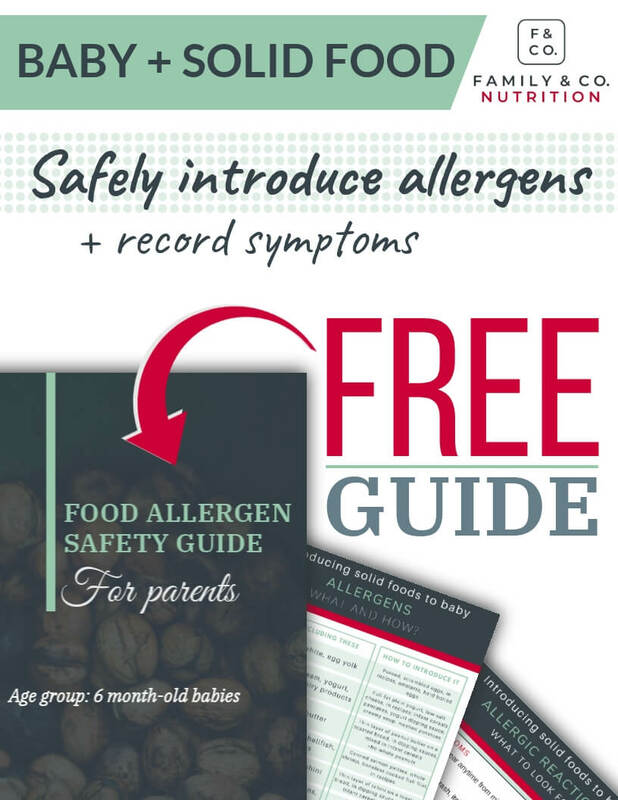 Infant Feeding recommendations from the Government of Canada. Responsive feeding: supporting close and loving relationships. The baby friendly initiative. UNICEF United Kingdom. October 2016.